Commercial honey bees often perform the bulk of pollination at cranberry marshes. The modern cranberry harvest in Wisconsin is made possible, in no small part, by the work of pollinators during the summer months. While cranberries can produce fruit without pollination, the process maximizes fruiting, berry size and even ripening when done successfully. Pollen and nectar are tucked up inside cranberry flowers, which hang upside-down with the opening facing the ground. Bees ensure that sufficient pollen grains reach the stigma of the flower, and without their efforts the resulting fruits can be small, deformed or altogether absent. Bumble bees (Bombus spp.) are well suited to pollinate cranberry flowers because they buzz pollinate, or shake flowers in a way that causes the pollen to drop down onto the bee. This ability to buzz pollinate makes bumblebees highly efficient at pollinating the cranberry plant (Vaccinium macrocarpon). Given this ability, approximately 22 percent of Wisconsin growers buy bumble bee colonies, which are placed on marshes at a rate of one to five colonies per acre. Honey bees don't buzz pollinate, and for that reason are less efficient at collecting pollen. However, honey bees make up for their lower pollination efficiency with numbers; a healthy honey bee hive can average approximately 40,000 worker bees, and these bees often perform the bulk of the pollination work on a cranberry marsh. Important both economically and ecologically, pollination services ensure optimal fertilization of cranberry crops. Around 90 percent of Wisconsin cranberry growers rely on renting commercial honey bee hives during bloom, when they are usually stocked at a rate of two to three hives per acre. These pollination services represent a significant economic investment for cranberry growers, who spend an average of $140 to $210 per acre on pollination. This high cost makes successful pollination an imperative for Wisconsin cranberry growers. Many other fruit growers develop written contracts with beekeepers to assure a mutually beneficial relationship. Conditions often include hive inspections conducted by a third party, the placement of hives near a marsh and the timing of their introduction and the application of sprays like fertilizers, herbicides or insecticides. While the yields of the modern cranberry harvest depend on commercial pollinators, there are over 400 species of wild bees in the Midwest, many of which are common in Wisconsin and pollinate cranberries. Bumble bees are among the species of pollinators native to the state that are likely to be present to varying degrees on most cranberry marshes. 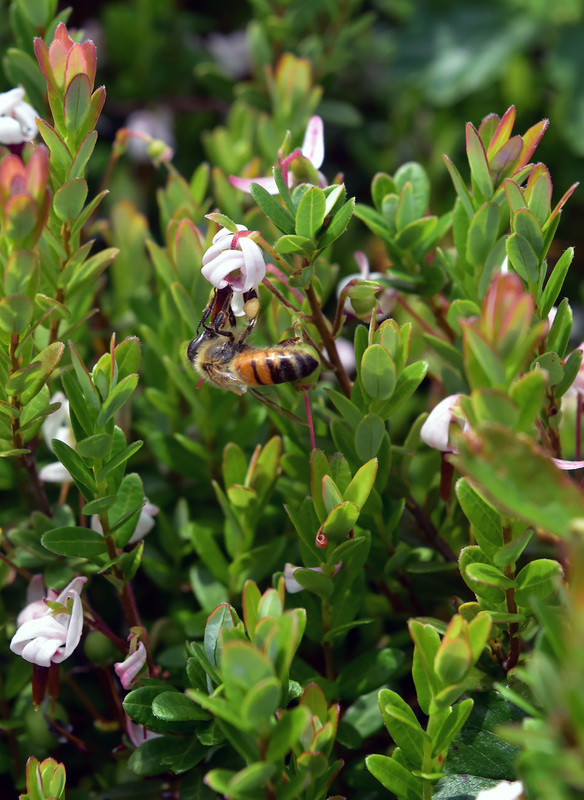 Native pollinators usually feed within one-eighth of a mile of their nests, so cranberry growers who wish to harness the productivity of native bees tend to maintain suitable nesting habitats near their marshes. For the 70 percent of native bees that nest underground, this means the preservation of areas with bare, sandy or loamy soil. The other 30 percent nest above ground, by tunneling into trees or constructing nests in cavities like those present in soils with tall grasses or debris piles. Strategic selection and placement of native flowering plants near cranberry marshes can also help attract pollinators. Although honey bee hives provide insurance for optimal fruit set, marshes with high populations of native pollinators may not require supplemental hives at all, improving the value of harvest yields. Editor's Note: Christelle Guédot is the fruit crop entomologist and extension specialist with the UW Fruit Program, and an assistant professor in the UW-Madison Department of Entomology. Pollinators Provide Extra Buzz To Wisconsin's Cranberry Crop was originally published on WisContext which produced the article in a partnership between Wisconsin Public Radio, Wisconsin Public Television and Cooperative Extension.